Rafael Gonzalez Moreno‘s work is a journey to the mechanics of childhood. To the inability of exact form, resulting as a ludic glance to the everyday scenario. The surprise of plasticity, the unpredictability of form, and excess color are part of a multiple world and routine escapes. As equally eccentric as popular, Rafael crosses any frontier to get to every public. Entering this Argentinian artist‘s plasticity implies a game of all or nothing, the way children play. Combining a childhood toy with an oven, travels between the darkness of melancholy and the ability to make the look over colors and venerations of another moment of history flexible. As lollypops that come apart in a frame, Rafael’s artwork inspires touch and disorder. Beating the art since his teenage times, Rafael worked in a design enterprise in Santa Monica, and understood since then what living from art meant, without imagine then how successful he was going to be in Miami and LA Art Show in 2015 with Art Unified. One of his great cultural assets that enrich his global view of the world was the possibility to visit and live in many different countries with very diverse cultures. “Having that opportunity opened me to a broader vision of everything surrounding me. I have always felt free, and when I felt otherwise, I did whatever was necessary to liberate myself. Not being too attached to people and places allowed me to deepen my own world and, although sometimes I found myself a little bit lonely, I focused on curiosities and emotions that materialized to some drawing, painting, or object. With the years, that became my own form of meditation,” the artist narrates. In that demonstration of freedom, we encounter an expressive universe that does not give place to confinements or censorships. The necessity to breathe a different air every day in order to renew spirits is part of Gonzalez Moreno‘s world. This way, his work is a mixture of textures, materials, and infinite sensibilities that give shape without becoming ingrained. His view over game and hours that restart daily considers toys as a symbol: “A toy is related to a stereotype of happiness, and it is my interest to destroy the superficial idea we have about them to transform them into a creation that radiates spiritual energy,” he says. This way, the material he works with becomes an exploratory object of total color saturation on industrial materials. In his words: “Plastic injected in the form of a toy to act as another palette resource, in order to create a relationship of colors and shapes to adapt to.” Rafael sharpens his focus and breaks his work off to explain what is beyond the playful; dialogues between darkness and light to rescue a critical observer searching for an introspective harmony. As it narrates and transcends, Rafael’s work inspires to question on how to work with plastic, the different processes encountered and the result of a toy’s travel through an oven. Choosing the object and the temperature needed to melt it, the manufacture of these works evokes heat and memories in the same fog: “I draw what I am going to create and then unify it naturally while cooking. I manipulate the background with different tools, and I create geometrical or psychedelic images. When I have all the pieces, I assemble the picture like a mosaic,” Rafael narrates whilst explaining his creative path. 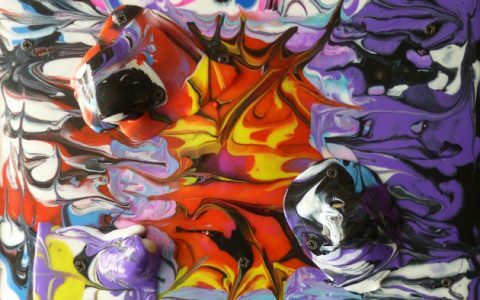 The thing is that, for almost ten years, his artistic work has consisted in melting toys and, as somebody who tries all possible combinations of watercolors and acrylics, his experience on pallets and color handling broadened in an incalculable way. 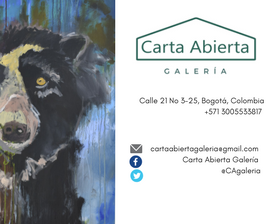 And, with these artworks, he helps children from poor neighborhoods with a bigger dream which goes behind of the visual art: to build a children’s museum. In this regard, González, worked in Sweden with children between 12 and 21 years, who had criminal behavior; and in Argentina, with depressed children making artworks that are sold for taking care of the costs of education and food. And now opening a cultural center with the support of Autopistas de Buenos Aires, who gave them the place for the center. “Magic is to transform a product to demonstrate that everything can be a gigantic illusion when it reaches the hands of art,” Rafael says. This is how he speaks of games and spirituality from an oven and plastic toys. The honesty of every artist is transmitted through his work’s materiality and leaves no space for doubt. Melted plastic means psychedelic colors, critical games that question firmness of thought and provide a new view, the same that happens when children encounter these pieces without a multicolor scenery that saturates view, confusing his work with abstract painting that startles us by the thousands of nooks and crannies that every object, every toy has.